Dr. Herrman has been in practice in Bradenton since 1992. After completing his undergraduate studies in biology from the University of Miami and the University of Connecticut, he completed a year of medical research in the field of immunology at the University of Pittsburgh before entering medical school there the following year. Dr. Herrman received his medical degree from Pitt in 1986 and pursued his residency training in General Surgery and Urology at the University of Rochester, completing his training in 1992. Dr. Herrman practices all aspects of general urology including the treatment of prostatic disease and tumors of the urinary tract. He has particular interest in the management of stone disease, surgical treatment of male and female incontinence and erectile dysfunction. Dr. Herrman continues to pursue post-graduate training and is experienced in minimally invasive therapies including laser therapy and laparoscopic surgery of the genitourinary system. Dr. Herrman grew up in Pittsburgh, PA as the seventh of nine children. He has practiced in Bradenton since 1992. He lives with his wife Rebecca, and has a daughter Emily and two dogs, Gabby and Caleb. He enjoys boating, fishing and sports. He is a member of the Manatee Medical Society, Florida Medical Association, and the American Urological Association. 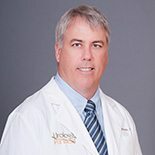 He is active in the community and recently was recognized by his peers as one of the area’s top 50 physicians, as featured in Sarasota Magazine.